Lahore: Chief Minister Punjab Muhammad Shahbaz Sharif has said that elements involved in selling substandard, unhygienic and adulterated items deserve no leniency. He said that Punjab Food Authority should continue its action against those involved in adulteration in edible items. He said that those involved in adulteration in edible oil, ghee, milk, spices, water and other items should be exposed and such elements should be in jails. He said that strict action should be taken against the persons involved in this heinous trade. He said that no one can be allowed to play with human lives. He said that deterrent punishment should be awarded to the persons involved in this heinous trade. He expressed these views while addressing a high level meeting, here today, which reviewed the performance of Punjab Food Authority. The meeting decided to make the laws of Punjab Food Authority more strict and approval was accorded to recruitment of new Food Safety Officers and Assistant Food Safety Officers. The Chief Minister said that all food testing laboratories should be outsourced as soon as possible. 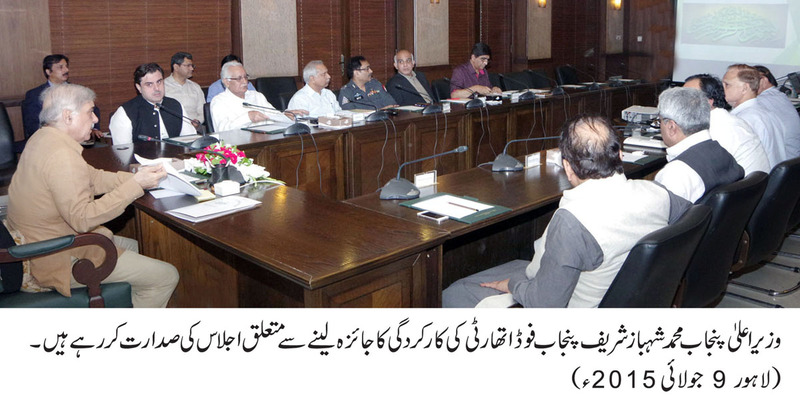 He said that the scope of Punjab Food Authority should be expanded to four more districts during next four months. He said that the administration should continue crackdown without any discrimination against adulterated items in other districts as well. The meeting decided to make manufacturing and selling of substandard, unhygienic and adulterated items as non-bailable crime. Shahbaz Sharif appreciated the performance of DG Punjab Food Authority and his team for taking effective action against hotels, restaurants, bakeries, shops and factories involved in manufacturing and selling of substandard food items and said that Punjab Food Authority is now playing active and effective role in the real sense. He said that all out resources will be provided to Punjab Food Authority, however, it will have to take those involved in this heinous business to task in the real sense. DG Punjab Food Authority gave a detailed briefing regarding the performance of his institution. Provincial Ministers Rana Sanaullah, Bilal Yasin, Advisor Health Kh. Salman Rafique, Advisor Livestock Chaudhry Arshad Jutt, Chief Secretary, concerned secretaries, Commissioner Lahore Division and concerned officers were present on the occasion.